Ok before I say anything, I haven't got any idea how to post this because it involved two images and combining them in one picture detracts a lot. I'll post the images separately and link them via thumbnail for now. Ok, so I drew this, and the other image to explain my AU more specifically angel Klavier. Kristoph in the form of the Devil is capable of producing a poison that can kill a human instantly. It normally appears as a bright blue misty substance and can only affect if it enters the body. (Not through touch.) It can be easily injected though his claws. In Kristoph’s murder attempt, he tried to poison Klavier by said substance, but of course like always his attempt failed. Little did he know Klavier was resistant to it simply because they are genetically very similar. Kristoph carries the poison in his blood and all he really did was pass that onto Klavier’s. With the poison substance in his blood stream Klavier picked up some of Kristoph’s devil traits such as his talons and basically grew into a harpy-like Angel. 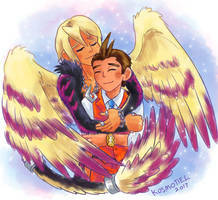 Klavier was unaware that he was an angel until later. He obviously didn’t pick up distinct devil traits like horns or the arrow tail. (Because Klavier’s too nice for that). The biggest draw back for Klavier is that he isn’t capable of shifting from that to his human (canon) self. Kristoph is able to shift form at will as he can control the flow of poison through the skull scar on his hand. Klavier lacks any such scar. So the only way to revert back to his normal self is to somehow remove the poison out of the blood stream which is super risky. This is the accompanying piece as you'd probs be curious what he actually looks like, (unless if you've seen him already which would probably be the case if you are following me with this). Oh noes, get the holy water!